Nearly two months ago a series of damning emails were made public in the player likeness lawsuit against the NCAA, CLC, and EA Sports. The important piece of info there was the acknowledgement that the NCAA and EA Sports had neared an official agreement that would have allowed player names to be included in their licensed video games. Now additional documents have been unsealed showing the NCAA was well aware of, and openly discussed, real players being the basis of the characters represented in the games. A July 2003 internal email shows NCAA Director of Corporate Alliances Peter Davis relaying this response he received on whether EA Sports uses current football players’ names in video games: “We don’t actually use player names but we do use all the attributes and jersey numbers of the players.” Davis’ e-mail went on to raise the point that if Ole Miss quarterback Eli Manning got injured, the video game roster would reflect that change. Davis expressed concern whether using Manning’s number and attributes would be too close to his likeness and cause an eligibility issue. The NCAA Football series has never had roster updates so that comment is a bit perplexing. Otherwise though the comments there and elsewhere go to show the level of awareness regarding player representations and how they knew they were toeing the line. They also realized for good reason if they failed to do so the games probably wouldn’t exist and the money from the licensing and the ability to cultivate new fans would be lost. The NCAA was making only $4-8 million a year on the video game contracts. That number would be much higher if payouts had to be made to players and would likely prohibit any company from making any college-based video games. Already no one wants to take on college basketball given the low sales potential, high development costs, and concern over this very lawsuit. 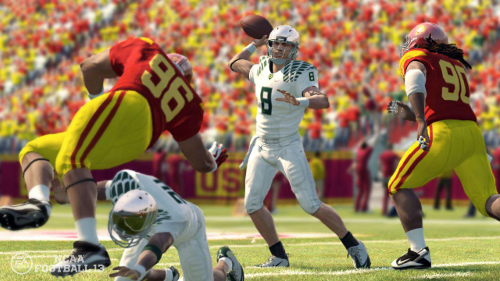 The NCAA Football series could also be in danger as sales have stagnated and this year fallen sharply. Without “real” players involved the potential for digital revenue is severely hampered. The lawsuit is the culmination of two high profile filings that were combined as led by Sam Keller and Ed O’Bannon. It alleges improper use of player likeness through various forms of merchandise and media including video games in which the parties in question conspired to avoid paying players for their rights. Some interesting details and claims regarding the case at hand were revealed when EA was reentered as a defendant after initially being dismissed. EA has won a previous case regarding player likeness with the courts ruling video games are artistic works rather than commercial speech and therefore protected by the First Amendment. The Supreme Court last year established forms of media, producing expressive works of art, are not subject to judgments based on incorporating someone’s name or likeness. This consolidated case in California looks as though it will be going much further and ultimately be the determining factor of how the NCAA proceeds in the future handling broadcasting rights, merchandising, and video games. Should a negative result come down, which one analyst has pegged as being a potential loss of $1 billion for EA, it would likely not just end the NCAA Football series but also with it any realistic possibility of college sports games being made in the future. The NCAA is currently seeking to block classification as class action. The trial now is stated to begin June 2014.